HIGH PRESTIGE EXHIBITION STANDARD OIL PAINTING "The Battle of the Nile". BY THE FABULOUS ARTIST DAVID ALDUS. This is the Battle that confirmed Nelson foremost of the British Navy's commanders. Even Lord Howe congratulated him on his victory. However, Nelson insisted that the word 'Victory' was not strong enough, he preferred to call it an annihilation. Only two French ships of the line, and two frigates survived with 1700 French dead. Replying to Lord Howe's congratulatory letter, Nelson wrote: "At five minutes past ten [p.m], when L'Orient blew up, having burnt seven minutes; the six Van Ships had surrended. I then pressed further towards the rear, and had it pleased God that I had not been wounded and stone blind, there cannot be a doubt that every [French] ship would have been in our possession." It can be construed that Nelson's wound and his blindness would have been caused by L'Orient's explosion. Such was its awe-inspiring sound and confusion that firing ceased on both sides until the L'Orient had settled on the sea-bed still laden with looted treasure. Divers still search for this treasure!!! The french fleet had anchored in line at Aboukir Bay, enabling Nelson to split his command so that the fleet sailed down either side of the line. This meant the unfortunate French ships experienced cannon fire bombarded both sides of their ships. A manoeuvre known as 'doubling'. From left to right, Aldus's painting shows the British ship 'Minotaur' cannonading L'Orient while Nelson's ship, 'Vanguard' broadsides it from the other side. No wonder L'Orient blew up! Nelsons's ship can been seen in the painting occupying the central part of the canvas, and has a figurehead of an ancient warrior bearing the red cross of England. 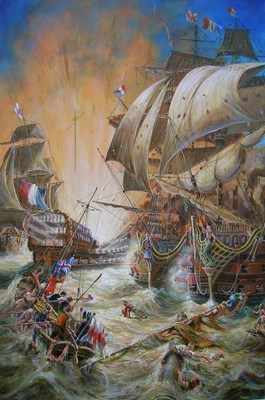 On the far left of the painting is the French ship, 'Peuple Souverain' which is frantically broad siding Nelson's ship. In true Nelson style, his ship is returning fire with enthusiasm, so that both sides of 'Vanguard' are firing off broadsides. Even before L'Orient's explosion, the guns' roar must have been deafening. There are several vignettes of sailors struggling to survive the sea. One, on the far right shows a sailor stripped to the waist, pleading with a civilian clinging onto a sail's crossbar to help him with his wounded comrade. The civilian just stares at him, unwilling to leave his place of safety. Another sailor in the prow of the boat at the far left of the canvas, foreground, is unbalanced by the force of L'Orient's explosion. The force of the explosion also stretches the flags of the great ships nearest L'Orient. Another if you look to the far left a Sailor is pulled from the roaring sea her arms flayed either side. The all male British Navy rescues French girls that are unusually aboard the French ships and pulled from certain death from the seas!! !